When dive certified guests visit Jules' Undersea Lodge in Key Largo, Florida, they discover that the name is no marketing gimmick. 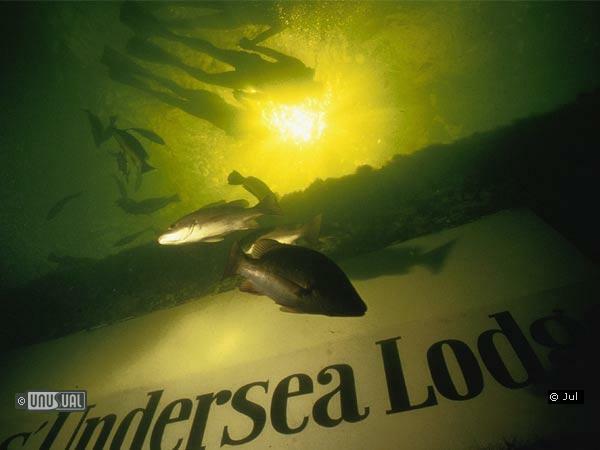 Just to enter the Lodge, one must actually scuba dive 21 feet beneath the surface of the sea. Entering through an opening in the bottom of the habitat, the feeling is much like discovering a secret underwater clubhouse. 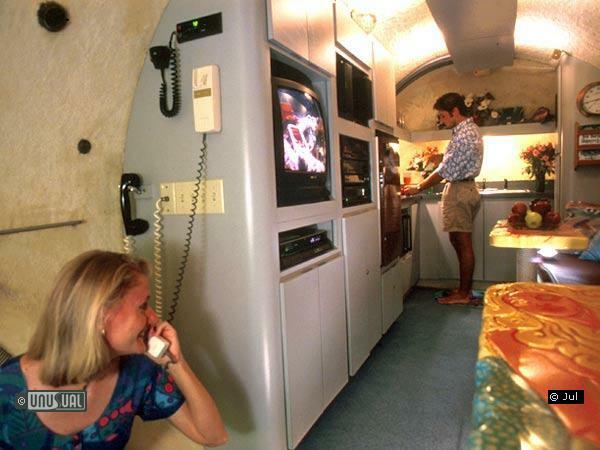 Jules' Undersea Lodge started out as the La Chalupa underwater research laborator in the 1970s, and was one of the most advanced research habitats created. 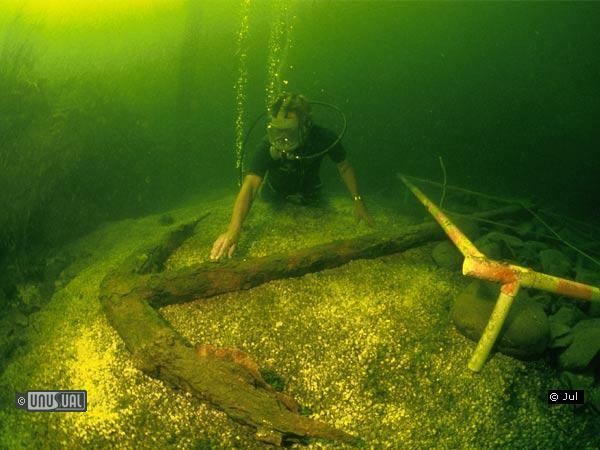 While special research projects are still undertaken, the running of the site now supports divers who wish to book overnight stays in either of two rooms for proposals or romantic celebrations. The main feature of each room is the large, 106 cm (42 inch) round window that looks out into the sea. While you're looking out into the murky beyond, the fish are looking in at you. The mangrove lagoon in which Jules is located is a natural nursery area for many reef fish. Tropical angelfish, parrotfish, barracuda and snappers peek in the windows of the habitat, while anemones, sponges, oysters and feather-duster worms seem to cover every inch of this underwater world. Guests explore their marine environment with scuba gear provided by the Lodge and are given an unlimited supply of tanks. Manages to reach a perfect balance of relaxation and adventure. The cottage sized building isn't short on creature comforts: hot showers, a kitchen, books, music, and video movies. They even have wifi! Best creature comfort of all is that they can deliver pizza as part of your overnight programme. Extra anchovies anyone! The interior has two living chambers, each 20 feet long and 8 feet in diameter. One chamber is divided into two 8 x 10 foot bedrooms where guests snuggle up and watch the fish visit the windows of their favourite underwater "terrarium". The other is an 8 X 20 foot common room with dining and entertainment facilities. 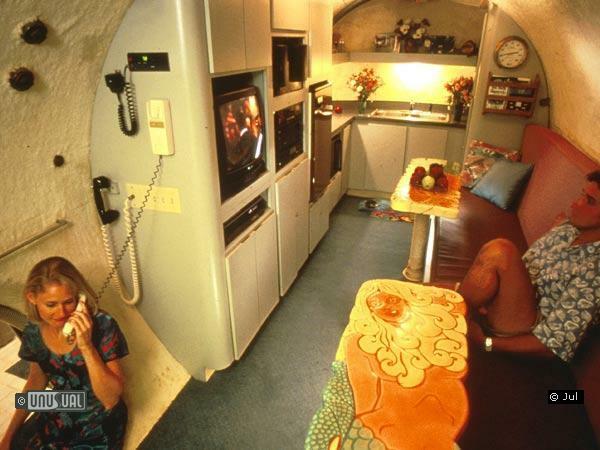 Between the two chambers is a 10 X 20 foot "wet room" entrance area with a moon pool entrance (similar to a small swimming pool), a shower and bathroom facilities. 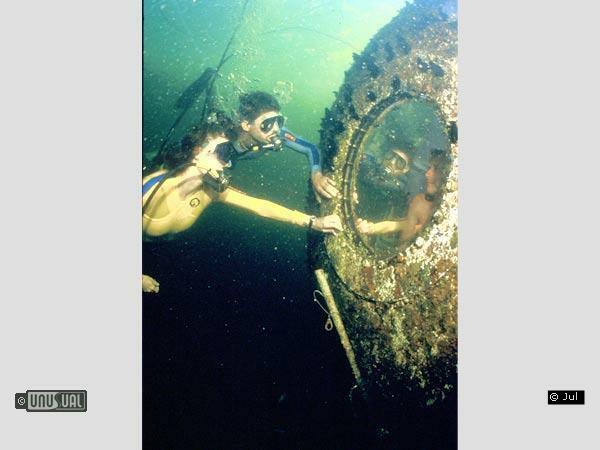 Jules' Undersea Lodge is located 1½ hours' drive from Miami International Airport at the bottom of the Emerald Lagoon in Key Largo Undersea Park, off Transylvania Avenue on the Overseas Highway (mile marker 103.2). Note for visitors travelling by air, a minimum of 24 hours onshore is essential after your stay underwater before flying. For couples looking for a truly different way to start their married life, Jules' Undersea Lodge offers all of the romance and adventure of an underwater wedding combined with the comfort and convenience of a dry setting. Weddings in Jules' Underwater Lodge provide exclusive use of the Lodge for an intimate setting for both the wedding and honeymoon. Check-in time is at 1:00 pm, and check-out time is at 11:00 am. 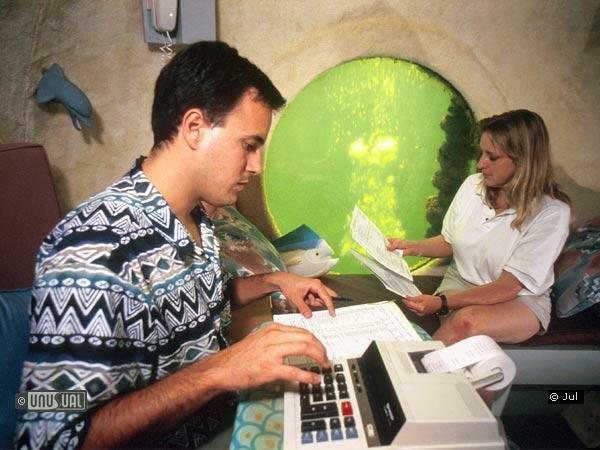 The couples earn their Aquanaut Certificates and qualify for an optional Underwater Habitat/Aquanaut specialty rating. 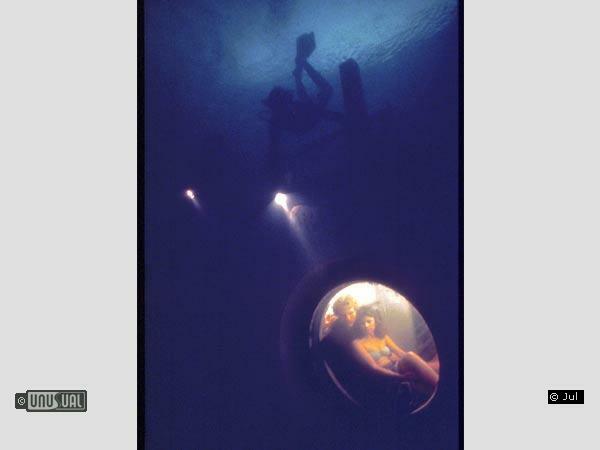 Extended underwater honeymoons in the hotel are available. Upon arrival to the world's only underwater hotel, the wedding couple is greeted by romantic music and fresh flowers in every room. The ceremony is usually conducted at 3:00 pm by a notary public, who dives down for the nuptial service. A toast and the cutting of the cake follow the ceremony. Dinner offers a caviar appetizer, a choice of lobster or steak, a hearts of palm salad and dessert. The hotel "mer-chef" scuba dives to the hotel to prepare the meal and serve the newlyweds. The chef also prepares breakfast the following morning. Venice: San Marco Basilica... in the dark! As a part of the Swiss Architectural Award, sponsored in Venice by BSI, the Swiss bank based in Lugano, the itinerary included a singular event: a visit to the San Marco Basilica at night. how small are the rooms? I hope some rooms are rilly tiny. Are any? Just wondering why the guy in the pic is at this fabulous hotel underwater and is... paying his bills?? I mean what is with the calculator??? Definitely for the true adventurist, I would probably feel claustrophobic and freak out halfway thru the night. We frequent Key Largo, however, and the husband has his brow raised at the idea...YIKES!! We (a family of five) stayed one night in July 2007. We had the entire habitat to ourselves. Fabulous service from the staff, what a rush. The kids (aged 14, 16, 18) were certified divers with many dives in their log books. The visibility in the lagoon was about 10 feet so the diving was only fair. But it was staying in the habitat that made it all worth while. We came back in 2009 and spent the day in the adjacent MarineLab. Cant' wait to come back and stay again! My husband & I spent 2 nights at Jules Undersea Lodge 9 years ago. It was an incredible experience. The diving was good, the view out the huge windows was great and the food prepared by the mer-chef was fantastic! It was just surreal to "live" underwater. The first night there was another couple with us, but the second night we had the entire lodge to ourselves. We had to stay in Florida, at a regular hotel for an additional night before flying home because of the length of our dive. It is a trip we still talk about and think fondly about. I hope we are able to experience it again someday! The stay was awesome! It was my first time scuba diving. We stayed one night undersea. Our luggage and our meals were brought down in waterproof suitcases! The meals were warm and very good. It was neat to sit in your pajamas and watch the fish go bye. I can't say enough good about the experience or the staff that attended my husband and me. We were married there. ( Just try to beat the undersea wedding cake & dinner!) Since, we have spent two anniversarys & one vacation down there! Incredible!! Per person / night inc. Dinner and Breakfast.